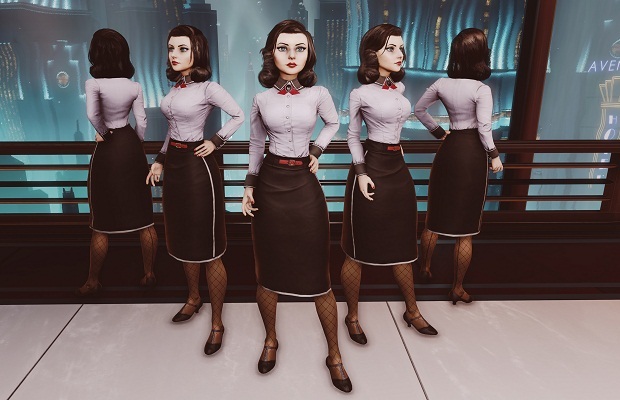 BioShock Infinite’s DLC “Burial at Sea” may not have been released yet, but Irrational Games has revealed Elizabeth’s entire new outfit from several angles at the request of the cosplay community. A full size version of the image can be seen here. “Burial at Sea” was announced on July 30 as a two-part adventure that takes players back to Rapture, the setting of BioShock 1 and 2, though a release date was not given. “Clash in the Clouds,” a wave-based combat DLC for BioShock Infinite, was released at the time of the announcement. What do you think of Elizabeth’s outfit? Had a chance to check out “Clash in the Clouds?” Let us know in the comments below or follow us on Twitter and like us on Facebook.